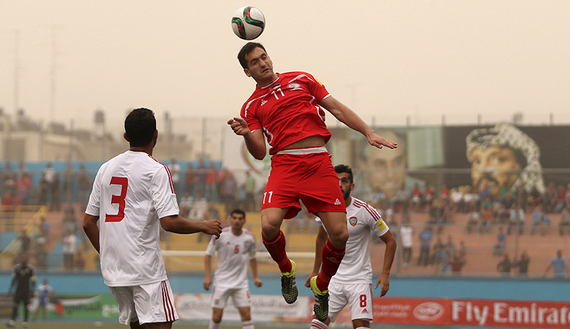 Matias Hadwa of Palestine jumps for a header during their 2018 World Cup qualifying soccer match against the United Arab Emirates at Faisal al-Husseini Stadium in the West Bank town of Al-Ram near Jerusalem, Sept. 8, 2015. (Photo by REUTERS/Mohamed Torokman). GAZA CITY — Israeli forces on Saturday shot and killed two Palestinian boys, aged 13 and 15, at a demonstration in the southern Gaza Strip. ____The Palestinian Ministry of Health said that Marwan Barbakh, 13, and Khalil Othman, 15, were shot dead during the protest to the east of Khan Younis. . . .
____At least 15 others were injured during the protest, the ministry said, although it did not provide further details. ____The Palestinian Red Crescent later said that its ambulance crews had treated seven Palestinians shot with live rounds across the Gaza Strip, in addition to 21 who suffered excessive tear gas inhalation. GAZA CITY (Ma’an) — An Israeli airstrike targeted a building near a home in Gaza City during the earliest hours of Sunday morning, killing a pregnant woman and her 2-year-old daughter after their home collapsed, a spokesman for the Ministry of Health in Gaza said. ____Ashraf al-Qidra said the woman, identified as Nour Rasmi Hassan was five months pregnant during the time of her death, her daughter Rahaf Yahya Hassan was also killed, and three other family members were injured when their house was damaged from the airstrike near the al-Maslakh mosque in southern Gaza City. ____Hours before the airstrike,sirens sounded across southern Israel, as a single rocket was intercepted by Israel’s Iron Dome in an area south of Ashkelon. ____The statement made no mention of any deaths or damages to civilian homes. RAMALLAH, West Bank – Palestinian soccer may have won its biggest victory over its Saudi rival before the teams even enter the pitch. ____The International Federation of Association Football (FIFA) has decided that the two national teams may play the second of two matches in the 2018 World Cup and the 2019 Asian Cup qualifications in Palestine after all, revoking an earlier decision to find a less controversial alternative. The reversal came after an Oct. 6 meeting in Zurich between FIFA President Sepp Blatter and the heads of the Palestinian and Saudi Arabian football associations, Jibril Rajoub and Ahmed Eid al-Harbi. For Israel and settler organizations, creating a Jewish identity and presence on the access road to the Western Wall is very important. Palestinians, on the other hand, view it as a dangerous provocation. ____The many stabbings in Jerusalem’s Old City in recent weeks have taken place in one precise location: Ha-Gai Street, or Al-Wad Street in Arabic. While the walled city is relatively small, it is interesting to note why the political and violent struggle over Jerusalem focalizes on its most heavily guarded street. The ultimate direction of the current violent escalation in Jerusalem and the rest of the West Bank is a mystery. 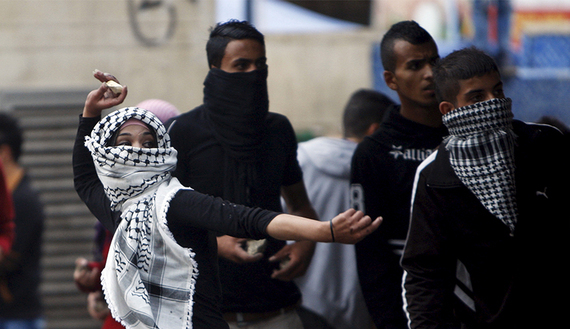 Is it the long-anticipated third intifada? Or is it merely a short-term spike in the escalation of violence? ____One thing seems clear: There is no way of knowing or predicting the depth, length or nature of what happens when people lose hope. Palestinian President Mahmoud Abbas’ decision to wash his hands of the 1993 Oslo Accord — which he himself had signed 22 years earlier — might be the straw that breaks the camel’s back. ____Without any peace process in sight and with the young Palestinian population seeing no future, it is not surprising that people are revolting. Blogger’s Note: This poem, and many others from the years shortly after the 1967 war seem to be more timely and urgent now than at any time since they were written. Rest him at the foot of the mountain, it knows his sorrow. Tell the will of his love and suffering. From the land of his youth will caress his face. Glimmer of light is still in them. On its threshold and to kiss its door. A Palestinian girl hurls stones at Israeli troops during clashes after a suspected Palestinian militant stabbed and wounded an Israeli soldier and was then shot dead by special forces, Hebron, Oct. 7, 2015. (Photo by REUTERS/Mussa Qawasma).